NOTE: Capitalized words within the text signify Photoshop commands. Dates refer to a Blog Post of that date in which the image here was posted. The geese were shot against a boring pale blue sky; the sunset, probably at the Jersey shore. In Photoshop I used the Magic Wand tool to select the blue sky and then chose Inverse under Selection. That left just the geese selected which I Copied and then Pasted on to the sunset image. Insure that both images are the same size and resolution. (1) The Candy Corn was spread on a glass plate suspended above my camera. The developed image was then Distorted in Photoshop by dragging the upper corners to left and right. This gave a sense of perspective by making the “overhead” pieces of candy larger than those at the bottom or (distant) end of the image. I then overlaid this onto an interesting red-sky sunset from my files, and reduced the opacity of the overlay to taste. (2) The moon was from my file; the carved pumpkin from a fall garden shop shoot. 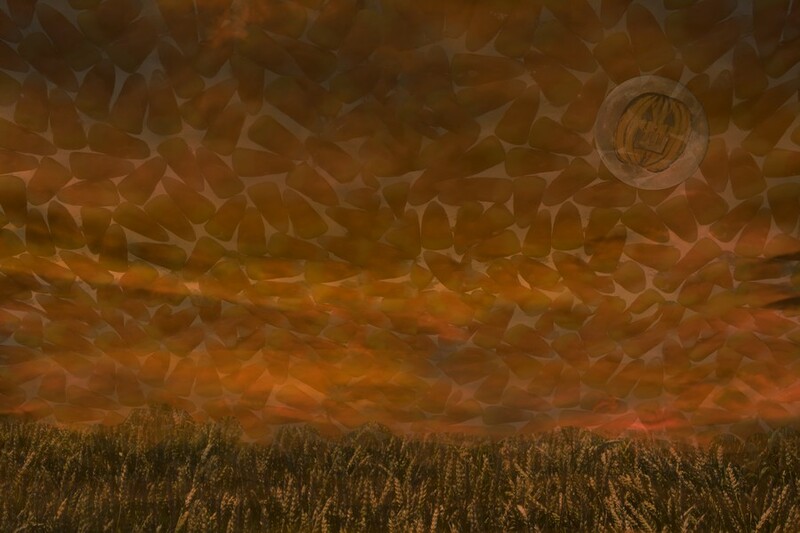 I combined them in Photoshop, overlaid them onto the Candy Corn sky image, and reduced the opacity. (3) The grasses were from a Lancaster County, PA file image. I overlaid the moon-candy image and then used a mask to expose the grasses. A larger version of this image can be seen by clicking here. Comments Off on HOW WAS IT DONE?